Over the course of President Donald J. Trump’s first year in office, it became plain that the man he picked to become deputy attorney general, career Justice Department attorney Rod Rosenstein, was a card-carrying member of the Deep State. It was apparent that he stood on the Establishment side of the Potomac when he appointed Robert Mueller as special counsel to investigate President Donald J. Trump and his campaign team, sans any evidence that crimes were committed (as required for the appointment of a special counsel) and one day after Trump interviewed Mueller to replace fired FBI Director James Comey. Meanwhile, Trump’s attorney general, Jeff Sessions, never seemed like he was part of the D.C. Swamp. 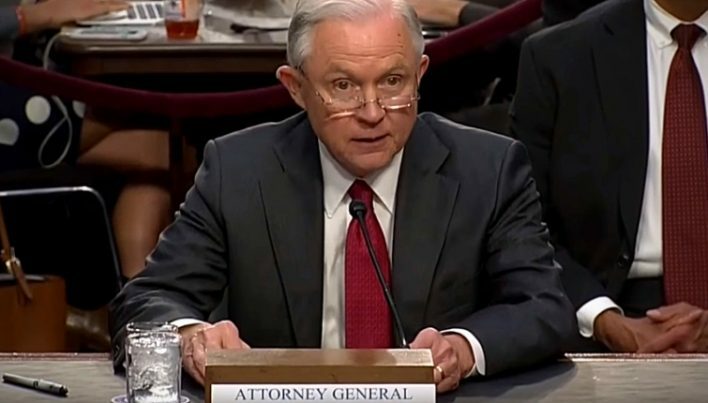 An early and vocal supporter of the president, Sessions was an effective pro-Trump advocate and seemed from the outset to receive an appointment to some position in the president’s Cabinet. Over the months since his confirmation, however, he’s quickly becoming part of a Deep State he railed against frequently during his final years as a U.S. senator, when the Obama regime was still in power. He’s become part of the ‘stonewall machine’ that Rosenstein built to prevent lawmakers from learning all they can about the rancid corruption at the highest levels of the DoJ and FBI, both of which were used to spy on the Trump campaign as part of an effort to undermine a duly-elected president. Various congressional committees — most notably the House and Senate Judiciary Committees and the House and Senate Intelligence Committees — have been attempting to extract information and documents from the Justice Department related to the ‘Russian collusion’ narrative. However, lawmakers and investigators are being blocked by Sessions, Rosenstein, and others when they ought to be opening up their books and records without hesitation — not simply to clear Trump and his people but because Congress’ job is to perform oversight of their agency. In recent weeks the relationship between the House Intelligence Committee’s chairman, Rep. Devin Nunes, and Rosenstein has gotten particularly adversarial, as the latter refuses to turn over materials that have even been subpoenaed. In particular, Nunes and Co. are seeking documents related to Rosenstein’s investigatory instructions for Mueller. Nunes wants to see the memo Rosenstein wrote empowering Mueller and he wants it in unredacted form. Sessions has jumped on the denial bandwagon as well, informing Nunes earlier this week he could not and would not comply with a subpoena for documents key to an ongoing investigation because doing so would allegedly endanger an intelligence source. Again, this is a non-starter; Nunes, as head of the Intelligence Committee, has top-level security clearance. He can see whatever it is that Sessions has. And what’s more, Nunes is entitled to see the documents he requests. Legal expert and Fox News contributor Gregg Jarrett agrees. And in fact, he says the time has passed for Congress to continue negotiating with both Rosenstein and Sessions. During an interview earlier this week on the network, Jarrett says both officials should be held in contempt and let the legal chips fall where they may at that point for redacting documents they have kept secret in order to hide corruption involving Comey and Mueller. This is easily fixable: Trump has the authority to declassify whatever he wants. He should order Sessions to walk over any documents that Congress is asking for, then tell him to clean out his desk — and take Rosenstein with him. Read about more Deep State corruption at Corruption.news.